Learn how to love your sales calls! Yes, you read that right! Sales CAN be easy. In fact, the more you enjoy having discovery calls with potential clients, the easier they are and the more 'YES! 'S' you get! This program is designed to help you become the coach who loves sales and easily creates win-win outcomes with your prospects. That means, both you and your prospect get what is best for each other. learn why people don't buy and how you can use that information to get the right people on the phone in the first place! find out the #1 biggest mistake the majority of coaches are making on their calls and how to avoid this! discover the 12 questions you need to be asking on your calls. This is the heart of what will make your call amazing and make asking for the sale natural and easy for you! uncover the MOST important question you need to be asking and why! how to ask for the sale with ease and NO ickiness! learn the critical way to ask questions so you don't get shut down. discover how to use 4 types of bonuses to create positive tension for people to act now! Here they are, in all their glory... the top 4 objections you are likely hearing on a consistent basis and how to easily overcome them (they aren't hard to overcome once you know how). I have to talk to my partner. Not sure how to get more sales calls? No worries! I have 16 ways laid out for you to easily get more discovery calls so you can practice your new skills and get more sales (and change more lives). If you are ready to really enjoy doing your sales calls and get more YES's from your ideal clients then this program is for you. 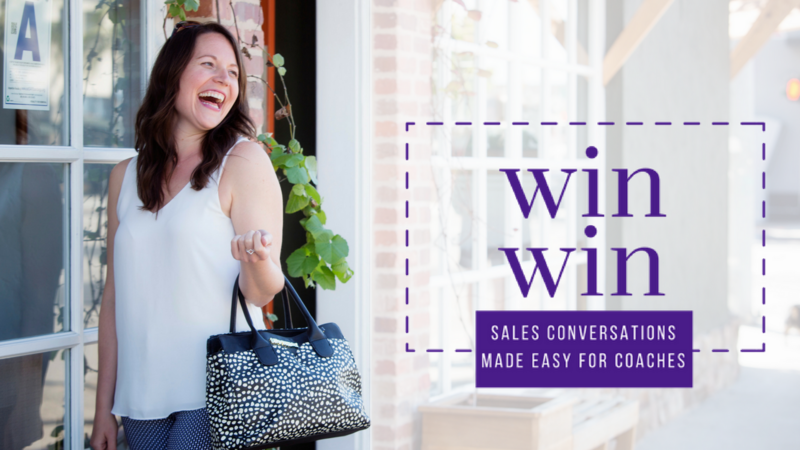 Win Win will teach you what you need to know to love sales and create more win-win conversations then you ever thought possible!